NM State continues at home and welcomes Utah Valley at 6 p.m. on Thursday, Feb. 27 live on AggieVision. The Aggies then host Bakersfield for the final home game of the season on Saturday, March 1 at 6 p.m. That game will be broadcast on KSNM AM570 with Jay Sanderson. The New Mexico State women’s swimming and diving team will conclude its season with a trip to San Antonio, Texas, to compete in the 2014 WAC Championships. The four-day conference meet will run from Wednesday, Feb. 26, through Saturday, March 1. Keep up to date on results here. The New Mexico State women’s tennis team will hit the road for three matches in Texas this weekend. The Aggies will start the road trip with a matchup versus Stephen F. Austin in Nacagdoches, Texas, on Friday, Feb. 28, before heading to Houston to face Rice on Saturday, March 1, and Texas A&M-Corpus Christi on Sunday, March 2. The New Mexico State baseball team hosts a four-game series against Oakland, Friday, Feb. 28 through Sunday, March 2 at Presley Askew Field in Las Cruces. Game one on Friday starts at 6:05 p.m. (MT) while a double-header is scheduled for Saturday, March 1 starting at 1:05 p.m. (MT). Friday's game and game one of the double-header on Saturday is scheduled to air over the radio waves in Las Cruces on KSNM AM 570 with Jeff Matthews giving the play-by-play. Sunday's series finale starts at 1:05 p.m. (MT) and will be on TV as a part of the AggieVision Productions. Fans should check with their local cable or satellite company for air times. Live stats are available online free of charge at www.NMStateSports.com and in score updates can be found on Twitter @NMStateAggies. 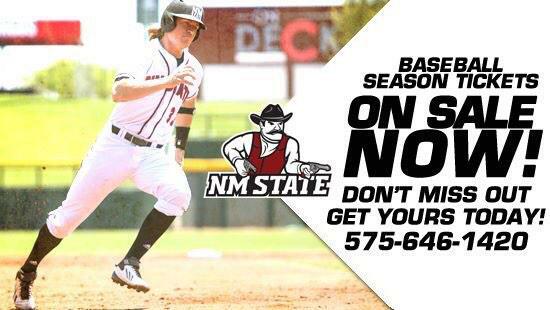 Follow on Twitter @NMSU_Baseball. The New Mexico State track & field team travels to Moscow, Idaho this weekend for the 2014 WAC Indoor Championships, February 26-28. The WAC Indoor Track and Field Championship will be held at the ASUI-Kibbie Dome on the campus of the University of Idaho in Moscow, Idaho. It will include nine WAC Track and Field women’s teams. There will be 34 different events in the competition and a women’s team champion will be crowned. Live results will be available at www.WACSports.com Follow on Twitter @NMSTrackField. Last Home Game and Senior Night! The New Mexico State men’s basketball team plays its final two regular season road games this week and has a chance to take sole possession of first place in the Western Athletic Conference standings. The Aggies take on Utah Valley, who is also currently in a tie for first place, Thursday, Feb. 27 in Orem, Utah at 7 p.m. (MT). The Aggies then head to Bakersfield to take on the Roadrunners, Saturday, March 1 at 8 p.m. (MT). Both games are scheduled to air on the radio with ‘Voice of the Aggies’ Jack Nixon giving the play-by-play action on 103.9 FM in Las Cruces. Live stats will be available online at www.NMStateSports.com free of charge and in-game score updates will also be give on Twitter: @NMStateAggies.